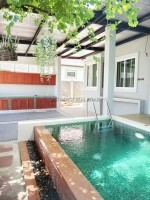 With a New sales price of 4,800,000 Baht, This newly completed home is an Exceptional value at only 19,200/per sqm. Jing Jing Laaw? This stunner is a healthy 250m2 3 bedroom 2 bath beauty. It has an open,airy floor plan and has views to your private pool from almost every room. With a very modern design and a bathtub in the master bath, you'll feel spoiled everyday. With private, gated parking to your house and 24hr security and CCTV you'll always feel safe and secure day and night. Welcome Home. This house is sitting on 100Wah2 is held under Company name. Call to arrange a viewing before its Gone!